COVINGTON, Kentucky -- Plans for the iconic Bavarian Brewery at 12th and Pike streets in Covington are speculation no more: Developers will renovate the historic space and install Kenton County government offices there. 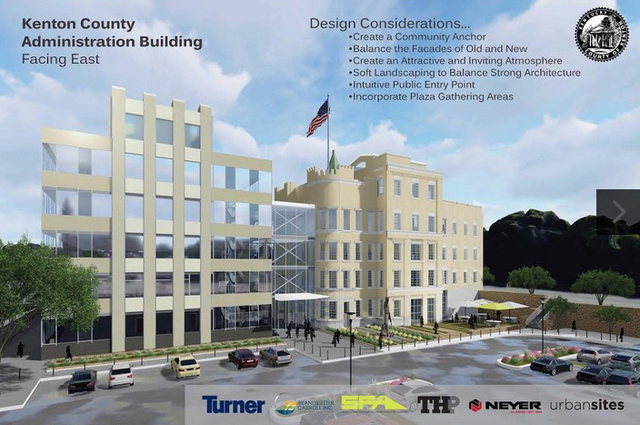 Renderings from Turner Construction, who placed the winning bid for the project, show a design that retains part of the building’s historic castle-like façade, blending it with modern elements like above-ground parking. Turner Construction will also renovate the county’s current office tower at Court Street near the Roebling Suspension Bridge. That building will be converted to high-end residences. Construction at the Bavarian Brewery site is expected to begin later this fall. County employees are not expected to vacate the Court Street offices until early 2019. Kenton County Fiscal Court purchased the space for $4.5 million last July and hosted public forums last month to gather feedback for the proposed designs. The plans have been met with mixed reactions from residents, small business owners and visitors in the area. A rendering of what the Bavarian Brewery would look like when it becomes the Kenton County Administration Building. Some believe the structure should continue its commercial use as a business that serves the larger community. Others are confident in the future of the historic property with county administration at the helm. Still more residents are eager to see the property improved regardless of who owns it going forward; the crumbling brewery is currently something of an eyesore, visible just off the Interstate 75 cut in the hill. “I personally believe it is great for the development of the existing neighborhood and will introduce many new businesses and individuals to the area,” said Aaron Galvin, who owns Covington Coffee at 508 W. 12th Street. That’s the view shared by Covington’s Center for Great Neighborhoods, a nonprofit community development organization that has been working for years to make targeted improvements to historically overlooked parts of the city such as the Westside, where the Bavarian Brewery is located. In recent years, 12th Street/Martin Luther King Jr. Boulevard was widened and is now seen as a pedestrian-friendly thoroughfare home to a growing number of thriving restaurants, artist spaces and storefront businesses. Not everyone is thrilled with the proposed plans, however. Frank Biro isn’t a Covington resident, but he frequents Covington’s restaurants and other businesses and doesn’t think the historic brewery should be used for government purposes. Most of the building was constructed between 1903 and 1909. The Bavarian Brewing Company owned and operated the space until 1959, when it was acquired by International Breweries Inc. The facility sat vacant for much of the period between 1966 and the late 1990s, when it saw new life as the Party Source, Brew Works and later Jillian’s nightclub, which closed in 2004. In 2008, the building was purchased by Columbia Sussex development company, which sought to tear down the structure when failed state gambling legislation hindered the group’s plans to turn it into a casino. In response to outcry from a number of residential and governmental sources, the city of Covington stepped in, denying the request for demolition and engaging in a long legal battle that resulted in the property becoming available for purchase by the county.